Made from exquisite beech wood with maple wheels and finished with a non-toxic paint and lacquer, each Milton Ashby Monochrome Aeroplane is as unique as the wood grain itself. For a truly special gift, add a personalised touch with the recipient’s name and birth date laser etched into the aeroplane’s wing. 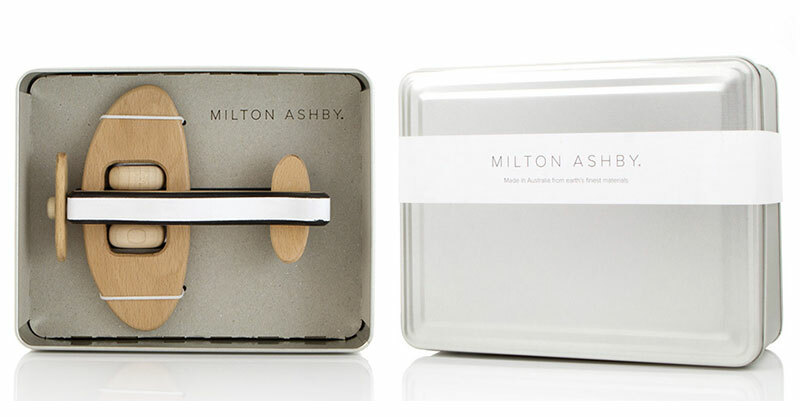 In true Milton Ashby style, the toy aeroplane is beautifully presented in a metal gift box, perfect for gift giving. This sweet Monochrome Aeroplane Toy is priced $65, with personalisation just $5 extra. Order direct from Milton Ashby.